Speaking of new drugstore nail stuff, have you seen these? They're called Kiss Nail Dress, and they're jeweled nail strips. I haven't used them yet, but they looked so cool, I had to have them. I've seen similar products from other brands (Dashing Diva comes to mind), but these are much cheaper and easier to find. What's cool about these compared to normal nail decals or nail appliques is that they're textured. There's actually a three-dimensional design. Little jeweled bubbles that stick out and look like you took the time to sit and glue hundreds of rhinestones onto your nails. Right now there's a $1 off coupon on the display, which makes them even less expensive. Bonus. Will report back after I've tried these, but I don't know when I'll get a chance to test them for wear. Kiss also has a website where you can check out all the designs, plus a tutorial video that I should probably watch before I try to apply these. I've seen them and tried them! Love them! They are supposed to last about a week, but I didn't test that. I got one of the ones with out the jewels. I will definitely buy them again! Those look really cool. Like colourful dewdrops. Oooh neat! I'd for sure try these. These look amazing! I haven't tried nail wraps before, mostely because I don't like the designs. But these look great. Unfortunately they don't sell KISS in my country ( at least not the nail wraps ) so hopefully I can get these online! 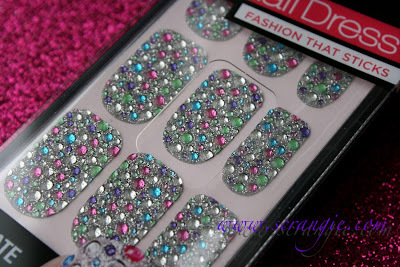 I didn't get these because I think they are just stickers and not nail polish strips like the Sally Hansen ones. For removal, they say to just peel them off your nails - ouch! Those look like HELL to remove! Plus they're really expensive! Sorry I didn't mean to double post. Where I live; they're $10! I think these would be good on toes b/c I don't change them as often. I picked up one of the designs (I think it was at Walgreens) but haven't tried it yet. I'm not sure they can match the SH nail strips for me, since I love the SH so much but they sure do look more blingy than SH. I got these in the pattern with gold "jewels". They lasted about 15 minutes for me because I peeled them right off. They're kind of stiff and my nails are really arched (not sure if that's the right thing to call them, but they're the opposite of flat!) and they just would not lay down properly. They might be fine for people with flat nail beds but they did not work for me at all. Good to know! Sounds like they might be similar to the ones Color Club did earlier this year, those were a huge fail :( I have really curved nails, too, uh oh! I purchased these in the gold "jewel" design and can't recommend them. My nail beds are very curved and these are very stiff. Not a good combination, they wouldn't lay properly on my my nails. I peeled them right off after about 15 minutes because they looked so bad. Oops, I double-posted too! Didn't think the first one took. I got these same ones and used them for my NYE mani. I couldn't get the edges smooth until I used Seche. Then the edges didn't pull up and they did last a week before I took them off. I used a little remover on the edges and then just peeled them off and they left a sticky gunky layer and it came right off with acetone. Everyone I ran into loved these nails and I WILL definitely wear them again. I got this same design to wear for a Christmas eve party and then was too sick to go so I haven't tried them yet. That's too bad that some are having problems with them - there were some very pretty designs in the display. Looking forward to your review! can wait to see these on your nails! I don't often like these nail polish 'stick 'em on' things. However these are kind of cute. They always seem pricy to me for a one use even if they do last a week. Where i have found they really fill a great niche in the market is for folks who find they simply cannot wear polish of any kind and NOT end up with it thinning their nails down by half, leaving them really dried out and pealing. Cannot say this type product works for all who have that problem - but a # of friends who never wore polish can use these and have not destroyed their own nails in 1 day's time. And yes, I did see these at a Walgreens. I look forward to seeing those! That's a wonderful design. By anxious to see how you like them. These were hard to file off on the edges. The "jewels" would come off with the file and leave a blank spot on my nail. Big fail. Can't wait to see what these look like on and how long you can manage to make them last. Let us know what top coat you use with them? Walgreen's had about 10 versions of these in stock this week. I debated about them but eventually decided against it - I have too many unused products already. I tried these a while back; I got the pink zebra striped one with little rhinestones. I didn't have much trouble getting them to adhere- they are decently flexible, and though they are much thicker than the polish appliques from Sally Hansen, they stick just fine and I did not have any trouble with peeling. I will say that they are a lot harder to file off, and I ended up just using a manicure scissor to trim them to length. It helped a lot with the gems yanking off, and it only looked a tad unsightly if you looked close. The nice thing about them is that the design is busy enough that any small imperfections won't show. The thing that drove me nuts, though, was the texture. I probably won't wear these for a week again, but just for a day or two for a special occasion. They would last a lot longer, but I was SO thrilled to get them off and have my normal nail texture back again. I wore these exact ones in the picture for 3 and 1/2 days. I removed them and my nails were completely ruined. I had to cut them all down to nubs & then repeatedly keep cutting and still having hard time getting nails to grow again. My nails had splits in them. Never had splits before putting these on. Not sure what I did wrong, but I would not recommend putting thise on bare nails. I wore these (the exact ones in the picture) for 3.5 days and when I removed them, all of my nails were completely ruined. Splits everywhere. I never ever had this problem in all my years. I had to cut them all down to nubs and then repeat every week and still (been about 2 months) having hard time growing my nails back out. I don't know what I did wrong, but I would not recommend putting these on your bare nails. My daughter loves loves loves these nail dresses. She has a horrible time keeping polish on longer than 24hrs. These allow her to have a manicure that lasts over a week almost two weeks. She is a teenager who very active and has her hands in water almost daily due to swimming. She will even take the unused strips and cut the into deals for her nails so she is not wasting.